Special rates for Jet Ski Club members! All Skis are serviced beyond the workshop manual requirements. We have developed our own “best practices” from many years experience. This includes ensuring the maximum amount of oil is extracted using our proprietary methods and keeping a clear record comparing the status of your Jet Skis' health as it ages. Please book in advance to make sure we can fit into your schedule and let us know you're a Jet Ski Club Member to receive your discount. If possible our members are encouraged to bring the Ski in hot after riding for the very best results, however we will work around this if required. Drop off is available all hours by arrangement. You are welcome to stay and observe (time permitting). We will even show you the basics to give DIY a try with our DIY kit that has everything you need to do a great service. Before you take your Ski away we will go through your home maintenance procedures in detail with you. This ensures your Ski is on the right track and will remain in perfect condition mechanically and physically for as long as possible. Our members are regularly invited on exclusive group social rides. Imported Skis are welcome. We are able to computer diagnose all of them. We cater for all makes and models including Seadoo, Kawasaki, Yamaha and Honda's - with or without warranty. We can even assist you with the most proven performance modifications. We will discuss your goals with you and share our experience to give you the best outcome. All Skis are inspected for general health before any modifications are done. If you are planning on Jet Ski Racing we can give you all the advice you need to get started. We have a pre and post race servicing offer to keep your Ski performing at it’s best while protecting it from unnecessary wear and tear. Please Contact Us for details. If your planning on Adventure Riding, Racing, or planning a Family day on the water, let us keep your Ski reliable and safe so nothing gets in the way of the Fun! Please note Trailer Bearings and repairs are part of our service. Its time to get out and have some FUN with your Jet Ski Mates! Service is what we do. Our techniques and time spent on your Ski will give it the best Service possible and therefore a better performing longer life. We keep them like new for you. At Jet Ski Services we service all kinds of Jet Skis! 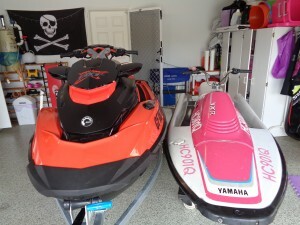 These two are 19 years apart (1990 and 2009) but they’re still awesome Jet Skis. These two may be 23 years apart in age (2016 and 1993) but we love them all at Jet Ski Services and Performance. No matter what you ride we treat them all like they’re new! Book your’s in for a Service a relax knowing it’s going to be the happiest Ski it’s ever been! Did you know that when Jet Ski Services carries out a Premium Service on your Jet Ski we also inspect your safety gear such as Flares, V Sheets, Epirbs etc for condition and expiry dates. If your Flares are out of date we’ll even dispose of them for you! Flares that are broken or corroded, expose their still hazardous chemicals, which could ignite by accident. The chemicals in flares become more volatile over time, which is why expired flares must be disposed of. If you’re not sure about yours and aren’t due for a service we invite you to bring them into the shop for inspection. If you need some advice on which ones to use and when we’re happy to show you through that as well. Bring in your Life Jackets too. We’ll show you how to ensure their condition is safe for use. At Jet Ski Services we can easily turn your plain old vinyl seats into luxury cruiser style seats. Covers are available in all shapes and styles and customising the seat shape to take some strain off your arms is a fantastic way to enjoy your riding even more. If Racing is your goal we can show you how all the professionals get their seats customised. Call in for a chat and we can show you a few examples of what you can do. Here is a Ski we did this week. Its a 2010 Yamaha FX SHO which came with flat vinyl seats. Before spending over $1000 on new seats the owner came to us and explained he’d like a little more comfort. Here is the result. What do you think? Next time your Waverunner Yamaha needs servicing, give it a treat with the best oils and the best care. Book it in at Waverunner Services - Servicing New and used, 4 strokes and 2 strokes! We look after Sea-Doos too! Next time your Sea-Doo needs servicing, give it a treat with the best oils and the best care. Book it in at Sea-Doo Services - Servicing New and used, 4 strokes and 2 strokes! By the way, we also love 2 strokes! Just head to www.2stroke.services for the best 2 Stroke Service! Looking for a change to the look and feel of your ski? Maybe you like the look of our custom seat modifications? Just head to www.JetSki.Graphics and let the fun begin! Here is a video we shot of a Seadoo wrap being applied to a Spark. Enjoy! Our first look at the all new SEA-DOO- GTR thats in for it's first service. WOW!! Its one of the best built Skis weve seen. The finish is quality all round. Did you know we have a Jet Ski Crash repair service? We have a direct link to the insurers and in most cases will have your quote placed with them for claim processing within 8 hours. We only use the very best experienced repair and painting techniques and all repairs are guaranteed – which is invaluable for those with the problematic Yamaha hulls! We offer an after hours emergency service for sunken Skis. This can save you thousands off your repair bill by preventing the need for a costly rebuild. Don’t worry JetSki Crash Repairs will get it sorted for you. And of course just you plain old every day Jet Ski Repairs!! 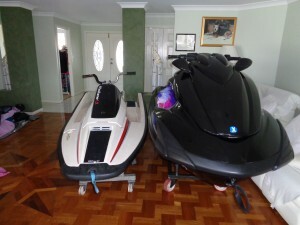 Are you looking for the best Jet Ski Servicing and repairs on the Gold Coast or Brisbane. * Choose from two locations at either Arundel or Greenbank. * Factory trained technicians with global racing experience. * New Jet Skis retain their warranty. If work is required we will organise it on your behalf. * Every service includes an Oil Waterproofing additive in case things ever go wrong so your protected from a rebuild. * We can even process your crash repair claim for you with approved repairers. For more info go to www.JetSki.Services. Almost forgot the 2 bangers!